The “?” icon at the top of every page contains all Spongelab help instructions. The page-tour icon is located in the red tab in the left hand panel of every page. Click it to display an overlay image that shows you where everything is on each page. The video icon is located in the red tab in the left hand panel of every page. Click it to display a video tutorial for the current page. Spongelab is a free online platform for playing, learning and teaching science. Interactive educational multimedia can be seamlessly placed in online lessons, then shared with students and integrated with powerful performance-tracking tools. Explore over 800 pieces of science content, including games, images, videos, animations, case studies & more. The Spongelab platform is the toolbar at the top of every page. It contains 5 keys areas: explore, my list, my lessons, my classes, my profile. Click on the key areas below to find out more about how to use each section of the website or view our helpful video tutorials to guide you through the process. The Spongelab platform helps you find high quality interactive science media, organize it, present and deploy lessons to your students and track your user activity once you have registered for a free account. Our educational platform is made free for teachers and students through our unique partnerships. Spongelab is a dynamic team of educators, researchers, designers, animators, programmers, partners and our users. Spongelab is a global science community where Spongelab, partners and users contribute and collaborate in the name of science education. At Spongelab we believe that high quality interactive science education resources should be accessible to everyone. The Spongelab platform makes it easy for teachers and students to stitch together interactive science media with traditional educational tools and techniques. Why not share and collaborate with the GLOBAL SCIENCE COMMUNITY in your educational pursuits? Spongelab Interactive is a group of scientists, teachers, animators, artists, and programmers passionate about science education. We believe that cutting-edge technology and stunning interactive media should be available to everyone, regardless of fiscal constraints. Learn more about our vision. Registering for a free account unlocks all the features of the Spongelab platform. When you are registered you will collect credits that can be redeemed for more valuable teaching resources! Save media and lessons in “my list”. Add students in “my classes” and contribute resources to the digital library in “my profile’. You will also earn credits that can be redeemed for discounts on valuable educational products! Visit our registration page to get a free Spongelab account. Click on the key areas above to find out more about how to use each section of the website or view our helpful video tutorials to guide you through the process. The overview provides a summary of your account information. Choose a Spong-atar at the left of the page. Your Spong-atar will be tied to your account and is displayed in the top toolbar of the website at all times. You will earn credits for selecting a Spong-atar! This section displays your credit, points, level and badge information. Click on the Details button to see more information. Click the Edit button in the Personal Details window in my profile to change your password. You must click Update at the bottom of the page to save your changes. Contact us to retrieve your login name. On the login form, click Lost your password? By default, your profile page is set to "public", which means that any user can see your profile page. This allows you to make use of all of the great social features that Spongelab has designed for science educators. If you make your profile "private", this means that only you can see it. If you've chosen to make your profile private, this means that you can't share lessons, show off your contributed content, or any of the other great features that a "public" profile page allows. None of your personal information is ever displayed or made publically visible on Spongelab. On a public profile page, other users will be able to see your shared lessons, contributed content, Sponge-atar, followers, who you follow, recent badges, recent games played, your user level, points, hours logged and registration date. IMPORTANT: If your username is currently your real name, it is a good idea to change it to something more private. Simply go to My Settings and pick a new custom username. By providing your school or institution name and school board or organization you will help us to understand how our website is being used so that we can better serve you. When you or your institution purchases a Professional Development License you will be given a school code that you will enter in my profile > my account > Affiliations window that will unlock school wide tracking and reporting capabilities. Linked social accounts displays accounts you have chosen to link to your Spongelab account. As Spongelab.com continues to make more partnerships you will have more social networking options available to you in my community. Go to my community and click on the icons for the accounts you would like to link to your Spongelab account. YES! Earn credits & points by contributing lesson plans, case studies, videos or quizzes that you have created in Contribute Content. You can contribute lesson plans, case studies, quizzes and videos. Go to Contribute Content in my profile. Click Create a lesson, case study or quiz; or Submit a video link and follow the instructions on the form. Make sure you click the Save button if you want to sign out and return at a later time to complete your contribution. Click the Submit button when your contribution is ready. No, Spongelab will review all submissions for Quality & Assurance (QA). Please contact us for more information or visit the Content Contributing Partner (CCP) page to find out more. Yes, you get credits and experience points when you submit, more when it passes QA and even more when other users access your contributions. Pass QA means that Spongelab Interactive has thoroughly reviewed a submission for quality & assurance (QA) for educational purposes. Credits are the currency of Spongelab.com. You earn Spongelab Credits for everything you do on this site like searching, viewing, making lessons and classes. You can see them accumulating on the top menu bar beside your username. Credits can be redeemed for discounts on educational products. Yes, go to Buy credits in my profile. We use PayPal for secure online transactions. So you can use your PayPal account, a credit or debit card to purchase credits. Select Don't have a PayPal account? Select Pay with my PayPal account? Select Pay Now - your payment is confirmed. A record of your activity including redemptions is displayed at Buy credits in my profile. Click on these links to find out more about other transactions. Yes, you can buy credits through our PayPal ordering system, in the My Profile area, to my credits in my profile. For Purchase Orders Contact us for more information. Completing your Personal Details in my profile. Viewing a digital asset at explore for the first time. Using site features like my classes for the first time. Use the search bar that at the top of the explore page to look for graphics, games, animations, videos, case studies and other science topics. Use the dropdown menus above the explore window to filter your search. The results are displayed in the explore window. This is the accordion-style menu that houses the Spongelab digital library content. The content is organized categories such as graphics & images, games & simulations displayed in the red tabs. Yes, use the display as menu above the explore window on the right hand side. Spongelab has linked all explore digital media so that you can easily create a list ofr lesson with related materials. Spongelab has linked all explore digital media to textbooks that cover the same topics to make it easier for you to stitch it all together. You must register for a Spongelab account. Spongelab content is free, however some featured games require users to register for a free account. This is because some games track and save player progress. My list is a place for you to save a list of graphics, animations, videos and other science content you have found from "exploring" our digital library. Saving it means that it is there each time you login and ready to use in my lessons. Register for a free account to save my list. To add an item to your list from explore, select the '+' on the far right under My List. Using the My List tab, you can manage all the items in your list and to create new lesson lists. Items can easily be moved in and out of lessons. My lessons - Link multiple digital media assets to a lesson, add your teaching notes and make a full presentation. My Lessons - create, manage, view your lessons. The viewer allows you to see all the content in your lesson in full screen mode, perfect for presenting in class. PROPERTIES allows you to name, describe and assign lessons to a specific class. The EDITOR allows you to re-arrange media in the correct order for your lesson or presentation, write notes and practice your presentation. VIEW displays a full screen view to present. You can add new notes while viewing the lesson. ARCHIVE allows you to store a lesson under Archived Lessons. This function can be helpful as a way to reorganize lessons that you are no longer teaching with or editing. It's still possible to share archived lessons with other users, using the Sharing Status menu. MAKE CURRENT allows you to transfer a copied lesson to the current lessons window, where it can be shared or edited. These are all different options for sharing your lessons with other users. By default, all of your lessons are set to "Private". This means that they will not be shared with other users. If you set a lesson to "Public" it will be listed on your profile page under Shared Lessons, however any notes that you have add to that lesson will not be shared. If you set a lesson to "Public with notes", it will be listed on your profile page under Shared Lessons, along with "Public" Lessons. IMPORTANT: Never share personal information in your lesson notes. Create a class in my classes. Add students to your class by sending them the class code. In my classes, select Add New Class. Fill in the fields and submit. A class code is a random alpha-numeric sequence assigned when you create a class. You give the class code to your students so they can join the class you created. In in the third column called class code in the Classes I've created window on the my classes page. Students must set up a free Spongelab account. Give students the appropriate class code. Students go to my classes and enter the class code in the Join Class box under Classes I'm Enrolled In. You must Accept a student into your class before they can access the lessons assigned to that class. Go to my classes and click on the appropriate class name. The Student list or window will appear. Status is the second-last column in this list and it will read Pending. Click on the checkbox in the last column titled Select and click the Accept Selected button beneath the student list. The Status column will display Accepted for students that have access to the lessons assigned for that class. Go to my classes, and select Reports. Real time reporting metrics are collected continually and allow you to see how users are interacting with your presentations and lessons. Access metrics track the number of times a lesson or interactive was opened or accessed. Usage metrics track the length of time spent with a lesson or interactive. Score refers to specific interactives that are achievement and goal based. Notes that are entered can also be viewed. You can see metrics for classes, students, and for each interactive or graphic. Define the group of users you'd like to see the metrics for. If a 'class' is checked, the report will populate an average across the whole class. If a multiple classes are checked, the report will populate an average across all the selected classes. Within a class you can select individual students or groups of students to look at more specific data averages. Next, if a 'lesson' is checked, the report will populate an average across all your lessons. If a multiple lessons are checked, the report will populate an average across all the selected lessons. Within a lesson you can select individual assets or groups of assets to look at more specific data averages. In the Graph area, choose access, usage, score or notes to see data for each of these areas. When you purchase a Professional Development License school-wide activity can be tracked and reported by the school administrator. This allows the administrator to collect and see powerful metrics on staff and student engagement in the digital learning environment. All the data can be exported as a spreadsheet to upload into other learning management systems. My community is a page where you can link your Spongelab account to other educational websites and social networks. The left window displays the websites and networks that are part of the Spongelab community. Select the websites you want to link with your Spongelab account. We want to stitch together all the educational resources and tools you need to teach and learn in one convenient location. A promo code usually provides you with instant or bonus credits and points. If you are a new user register for an account and enter the promo code on the registration page. If you are a registered user go to my credits in my profile. Enter you promo code at the bottom of the screen. A professional development license unlocks administrator tracking and reporting capabilities allowing the license administrator to track detailed metrics about school-wide usage. The top menu bar displays your accumulating credits and points. You can also see your score and badges in the Stats window on my account page. Badges are awarded through very specific behaviors or activities. Each badge provides you with extra credits and experience points. There are many secret badges waiting to be discovered! A specific number of points must be collected to reach a level. There are currently10 obtainable Spongelab levels. 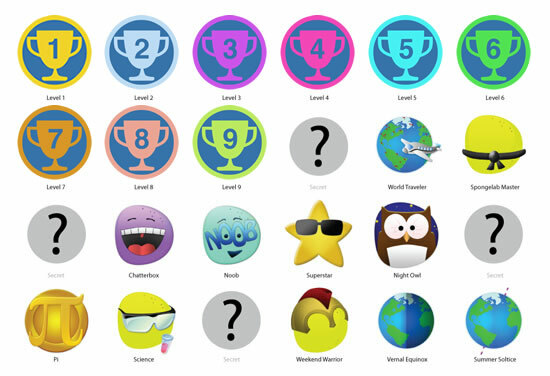 Each level has its own rewards associated with it, including extra credits and in some cases, the unlocking of site features. Our site is HTML5 compliant and can be accessed through any web browser and on most mobile devices. Yes. Some of our games require the Flash player plug-in for your browser. You're browser will tell you if the plug-in is missing. You can download the plug-in by clicking on the Flash logo. Some of our downloadable games require Java software installed on your computer. Below is the link where you can download and install required software for your system. Yes, we have a number of media assets available in French with more coming all the time. When you are searching for a particular topic, you can filter by language using the filter field under the search bar. The number of results is shown on the right side of each search results pane. Some games use flash. 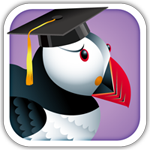 For these games, we recommend using the Puffin Academy Browser. This is because the iPad does not support flash. This browser can emulate a flash player. To play flash games on Android, you must download the Flash-Android-4.0 Android Application Package File. In order to install this file, you must enable Installation of Applications not from the Google Play Store. If you wish to download an older version of Flash Player for Android, click here to access the Flash Player archive. Look for "Flash Player for Android 4.0 archives". Alternatively, users can try the Puffin Browser. Please contact us if you have any other questions or feedback. Are you on a tablet? Some games may not work for you!